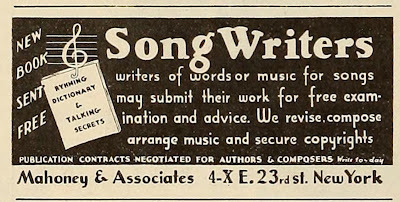 Vintage song-poem ads will return next! 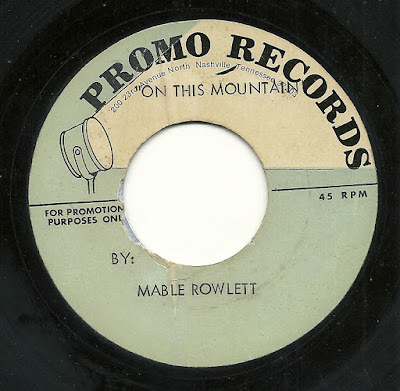 I have never featured the "Promo Records" label before today, and so am correcting that oversight today with a most appropriate ditty. I own perhaps 18 or so of this labels' records, and this is the first one which caught my ear enough to say "you have to share this right away". About half of the Promo Records acetates I own were written by Mable Rowlett, and were purchased at the same time, in a bundle. "I Saw a Crash On the Highway" is clearly the outstanding number from the bunch. 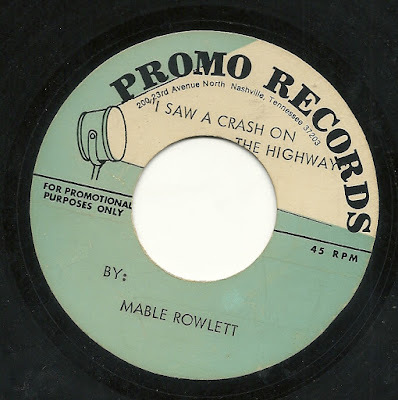 The phrasing of that title, and the lyrics of some of the verses of the song are all curiously indirect, given that the lyrics make it clear that the narrator of the song caused the crash, which involved fatalities, and that the cause was drinking and driving. On this New Year's Eve, I hope everyone takes Mabel's lyrics to heart. 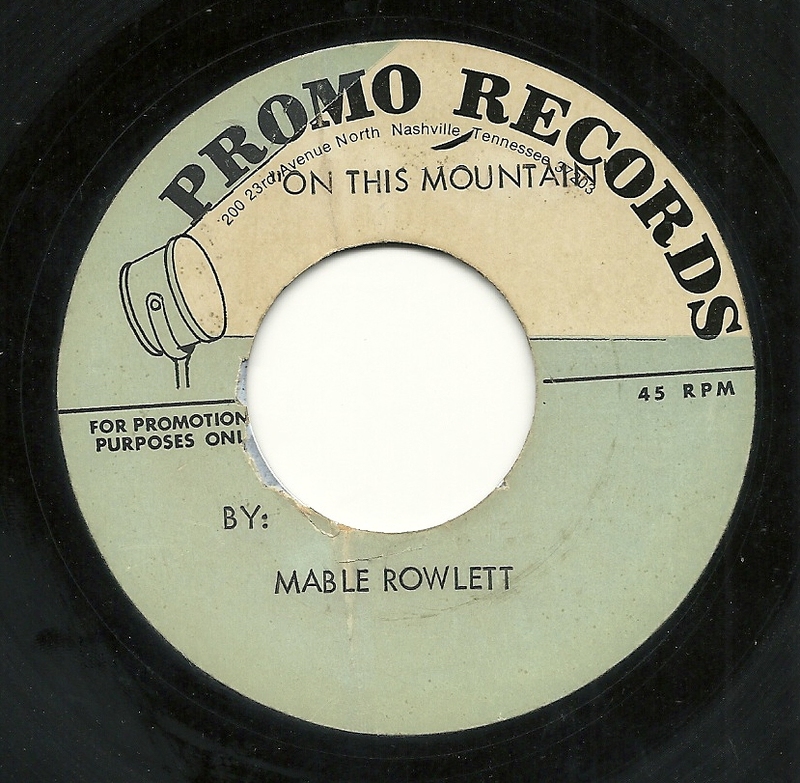 For comparison sake, here is another Mabel Rowlett offering from the Promo Records label, a much more typical number, on a religious theme, titled "On This Mountain". I hope everyone is having a wonderful holiday season! To start this week's post, here is another gift to us from Pete, who tells me that this ad dates back all the way to a 1914 edition of Photoplay! Write in now - he even offers Free Criticism!!! 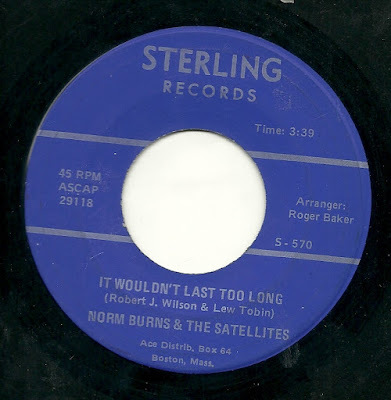 I know I featured Norm Burns fairly recently, but this record popped up on eBay recently, and I was more than a little intrigued by the title, and was very happy to come away from the auction as the winner. And so, I thought I'd share it all here with you, especially since the weather in much of my country has been so.... drafty recently. 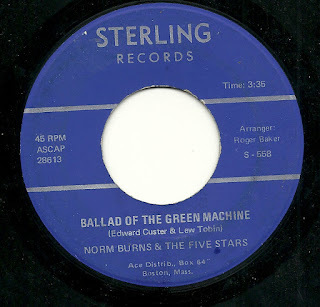 You see, in the song "Ballad of the Green Machine", Ol' Norm, or, more specifically, his lyricist, Edward Carter, recently (in terms of the date of this record) faced the possibility of being drafted, and seems to have signed up willingly instead, if I follow the lyrics correctly, for a three year tour. And so, we get a longish (by song-poem standards - more than 3 1/2 minutes) trip through the soldiering experience. While not as witty as Tom Lehrer's masterful tribute to the army - and if you haven't heard that, you really should - that's not really a fair comparison, as I'm not sure anyone's lived up to Lehrer on any subject he ever tackled. On it's own merits, this has a bit of dry wit to it, here and there, which I appreciate. And what's more, this is very likely also the only song-poem ever (and I'm willing to bet, one of the few songs of any type, ever) to make reference to Ptomaine Poisoning. I only wish it was a bit livelier - the tempo is really draggy. The flip side, "Just Drifting Along", does just that, and has very little that I find to appreciate. Your mileage may vary. I do get a weird kick out of the fact that they extended the song by going into a key change in the last several seconds, only to slowly fade the song out, with no further vocal, perhaps to drag the length over two minutes (yet still nearly 30 seconds fewer than what is listed on the label). 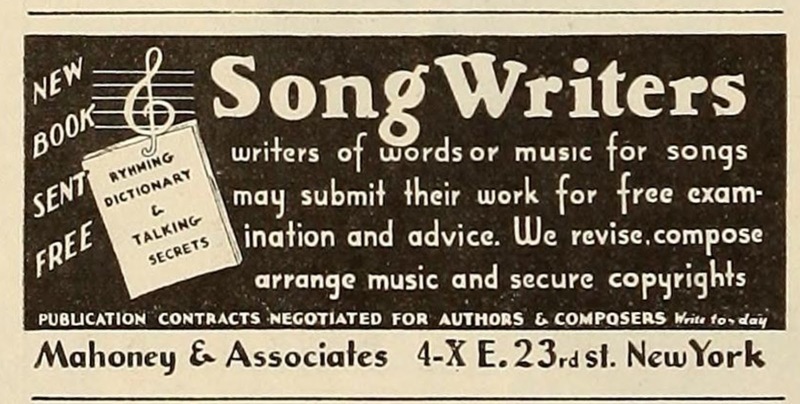 My guess is that the results of this ad's promises would have been sheet music, rather than a record. Thanks, Pete! And third, here's a record from Ronnie. Ronnie Records that is. 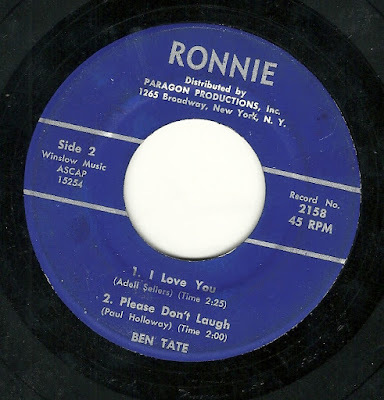 I have not featured the Ronnie Label very often. I find their typical product slick, soulless and exceedingly boring. Those aspects are not entirely absent among the four songs on this EP, but there are some things that make me want to share the record. Like many Ronnie records, this one features Sammy Marshall, or, as he was known to purchasers of Ronnie's products, Ben Tate. First up, a song I'm featuring as a tie in to the new, highly acclaimed motion picture Jackie, which came out last weekend. 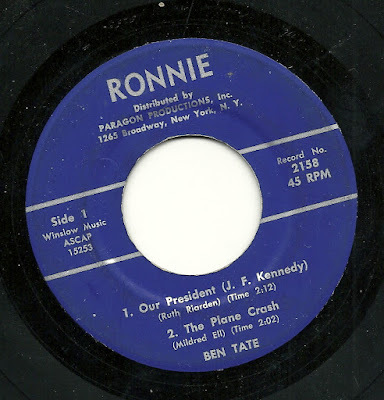 It has the clunky title, "Our President (J. F. Kennedy)", and insipid lyrics to match. A true winner! Next up is perhaps the calmest, most sedate sounding song ever recorded about a "Plane Crash". The writer sounds quite resigned to her fate, secure in the knowledge that she's in God's hands now. This is the antithesis of "D.O.A." by Bloodrock. However, I GUARANTEE that one listen to the last song, "Please Don't Laugh", will be worth the price of admission. I will not spoil the surprise, but I will say that most listeners will specifically be unable to "not laugh" upon hearing what the good folks at Ronnie did for this song-poem. 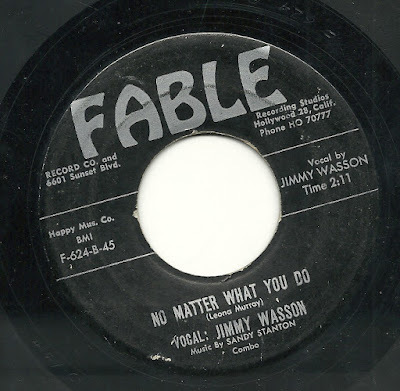 Determining the provenance of Fable Records releases is a real challenge. A good percentage of them seem not to be song-poems, but rather a mix of vanity records, label honcho Sandy Stanton's own compositions done by friends and hangers-on, and attempts at legitimate hits. I shared many of my favorite the (likely) non-song-poem Fable releases back at blog.wfmu.org, and I suggest you look for "Fable Label" there. Regarding this record, though, I have no doubt. 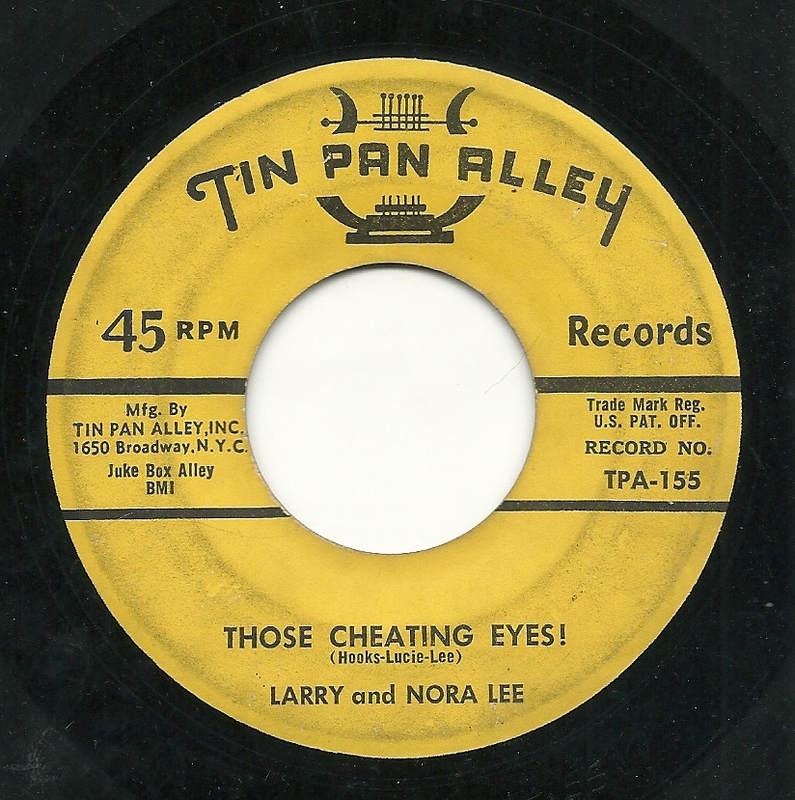 If you search through the "Catalog of Copyright Entries" (a really fun read)﻿, you'll find that today's song-poet was later credited with co-writing songs with both Jack Covais and Lew Tobin, each of whom was the head man at a song poem outfit (Tin Pan Alley and Sterling, respectively). That settles the matter for me. 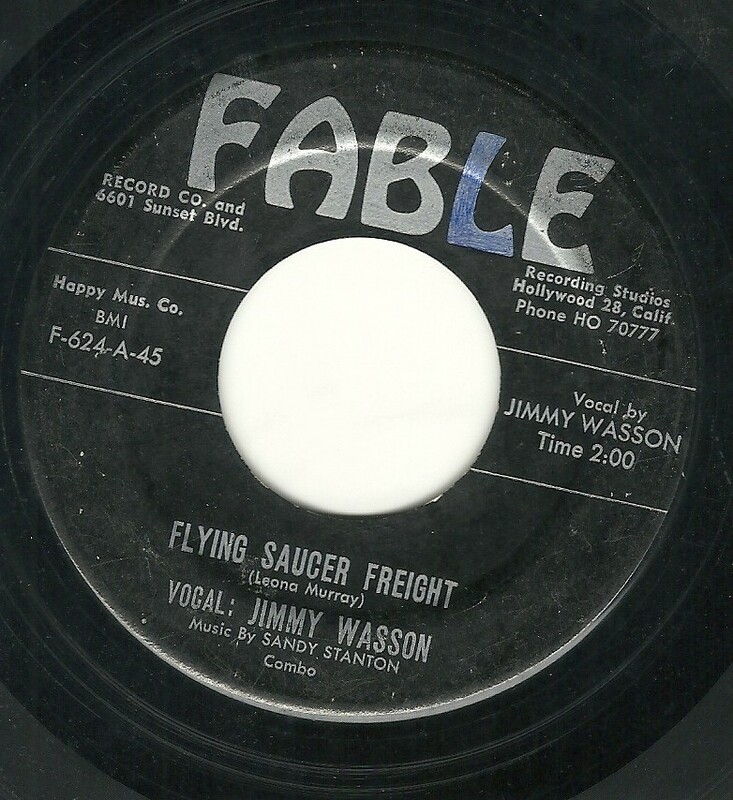 Here we have the previously unheard Jimmy Wasson, with the ever-present Sandy Stanton Combo, performing Ms. Murray's most excellent "Flying Saucer Freight", at a rollicking good, freight train styled tempo. 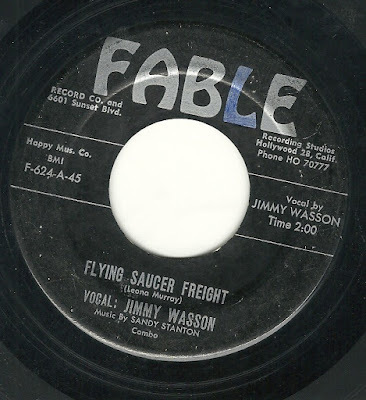 I'm personally mystified as to what the Flying Saucer references mean, as none of the rest of the song seems to be concerned with Outer Space, but maybe someone more in tune with the jive of them time (or, perhaps, familiar with train lingo) can hep me to what she might have meant. 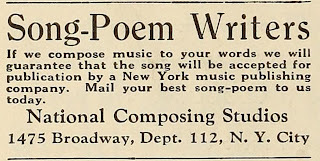 By the way, "Nordyke", which had been a significant player in the sheet music version of the song-poem scam, had become, by this point, perhaps the most ridiculous of the song-poem outfits, putting out material on the "Film-Tone" and "Star-Crest" labels which sounded like it was from at least 25-30 years earlier than the years those releases actually came out (the early '60's). 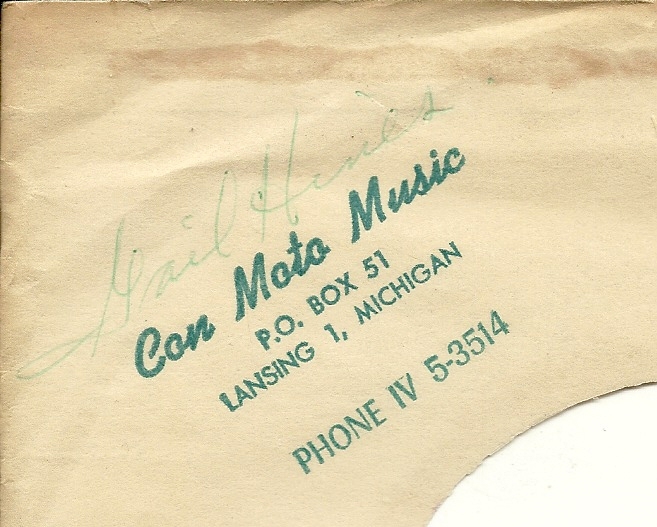 Search here and at WFMU for either of those labels and you'll hear what I mean. Much more on Nordyke can be found here. 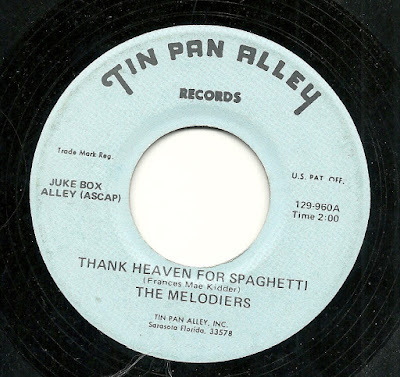 Here's the third entry that I'm sharing from a later-era Tin Pan Alley crew who called themselves (or who Tin Pan Alley called) The Melodiers. The previous two sets of tracks are unfortunately from the time period for which all of my uploads have been lost, but hopefully, someday, I'll make new links for those posts. But this group hasn't let me down yet, having offered up one good side for each of the (now three) 45's. Here they are with yet another winner, a tribute to, of all things, Spaghetti. I thoroughly enjoy this record. The band is still playing in the minimilist﻿ style favored for years by the label, but they are much more together than usual, and there's something playing along in the background - so softly that I'm not sure what it is - which compliments the guitar nicely. And the singer is taking the silly lyrics completely seriously, which helps a lot. A minor pleasure, to be sure, but still a pleasure. 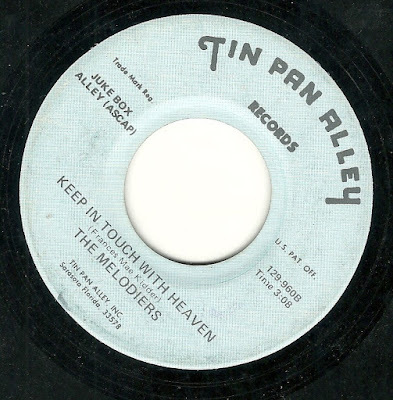 I can't quite work up the same enthusiasm - or indeed, any enthusiasm - for the flip side of the record, "Keep in Touch With Heaven", written by the same song-poet. It's a pretty non-descript mid-tempo number which is fairly uninspired on all counts, particularly near the end when the composer of the music seems to have run out of lyrics to go with the music he'd written, and the singer just stops singing, mid phrase, for several beats. Back From an Unexpected Break, Or: What the Hell is He Singing About? So..... I just took the longest break from posting here that I ever have, and did so immediately after saying that posts were about to become more frequent. So what happened, I might (or might not) hear some of you saying? Well, first it was the CUBS. As you may know (and if you don't, please learn this now), baseball is perhaps the best thing on earth. And the CUBS are the real reason Baseball exists. They are nice enough to let the other 29 teams play (and even let them win almost all the time). But without the CUBS, baseball would be a vast wasteland. And glory be, as you might have heard, if you were paying extra close attention, the CUBS rode the train all the way to the World Series, for the first time in my life, and won the dang thing for the first time in the lifetimes of 99.8 percent of humans currently alive. So that kept me busy. And by the way: YAY!!!! So I was busy glued to my TV set and radio for a few weeks. Then there was the horrific news of November 8th and 9th, which not only left me not wanting to do much of anything, but came in the midst of preparations for a huge event I was hosting on the 12th. So I would have a busy bee anyway that week, and I postponed my "OH MY GOD" thoughts and reactions, which were primarily on hold until the 13th. So after a week of not wanting to do anything I didn't have to do, I'm back now, and fully intend to provide song-poem wonderment (and, at my other site, amazing finds on reel to reel tape) on my regular schedule, going forward, for an undefined, lengthy bit of time. First up, another wonderful ad from correspondent Pete, in this case, from TV/Record Mirror Magazine. A handful of acetates have been found on this label, but they were also directly related to the very large (and often wonderful) Sterling label. But I've also heard from folks who are new to the site, or at least who haven't commented before (or, perhaps recently), and I appreciate all the great feedback, whether it's asking for something in particular, telling me a link isn't working, or letting me know that you've just discovered the site and love it. I'm going to miss some people, for which I apologize, but recently, this group has included Justin, Poucopelo, Drew F., and Rock Smith. I don't usually comment on the site, having no idea if the writer will ever see it, but if your post links to an e-mail address (or a site with an e-mail address), I will respond by e-mail. All that said, I have one of those "What the Hell" moments today. And this one is remarkable for a few reasons. 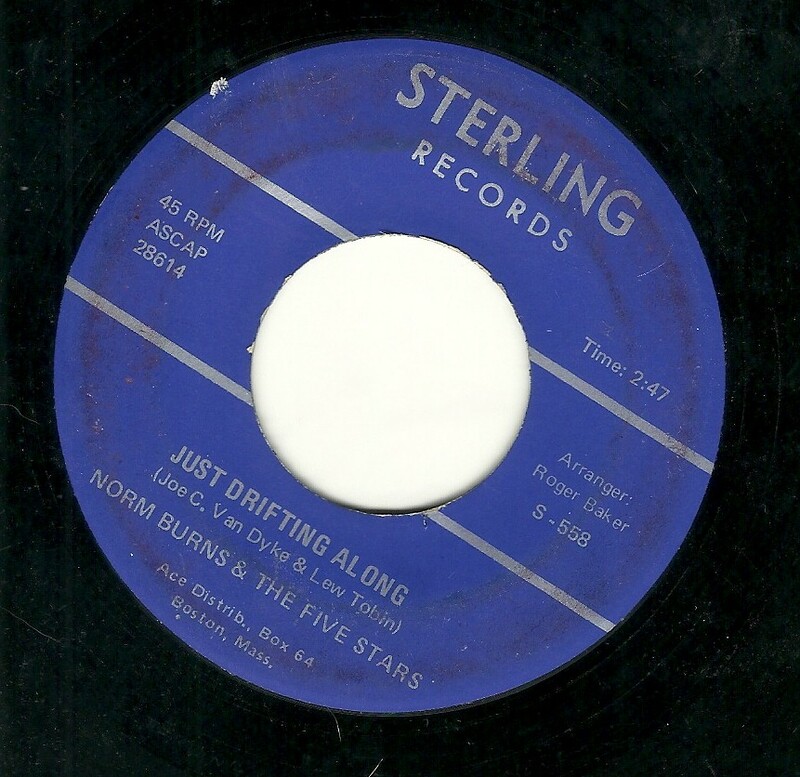 While it's certainly possible that there is a lower numbered record in sequence that I'm not personally aware of, this is the lowest-numbered Sterling record I can document to feature Norm Burns, perhaps my favorite song-poem singer. This may well be his very first record, and it seems to date from the mid '60's at the latest. And he and the folks at Sterling certainly don't sound quite in-synch yet here. This is one of the worst vocals from Norm, in terms of handling the lyrics and following the melody and chords effectively, that I've ever heard. I don't think he had the act "down pat" yet. It does have the feel of several other early Sterling records that I adore, such as "Darling, Don't Put Your Hand On Me", which vies sometimes for my favorite song-poem record of all. That's all icing on the cake though - just WAIT until you hear this thing. Maybe it's because my head's been foggy with championship followed by tragedy, with severe business mixed into all of that, but I can't make head or tail of what this song-poet was getting at, even after listening to this song nearly a half-dozen times. The song is called "For What Reason", which would seem to beg for a question mark, but none is there. That's okay, my brain created the question marks, larger and larger and more numerous, as I listened to this song. If you have figured out what he's singing about, please advise. Glad to be back. I won't be gone so long again, if I can help it! Halmark Records Meet the Actual Sounds of the 70's! I apologize for the lack of posting this month. It's been tremendously busy, as I've been preparing for a big event I'm part of, had a bit of computer problems, and put everything on hold in order to take the once-in-a-lifetime chance to meet one of my heroes (more on that in a future post). What caught my ear was the first track, "Everybody Wanna Dance!". ﻿This submission seems to have forced Halmark into the 1970's. Because none of their tired, MOR flavored, or Muzak flavored backing tracks would have fit this lyric at all - it's quite a different lyric than the flowery, sometimes thoughtful, sometimes ridiculously overblown lyrics they usually got. Even the word "Wanna" seems quite a ways out of their typical audience's wheelhouse. And those lyrics: It's about dancing to the latest beats. 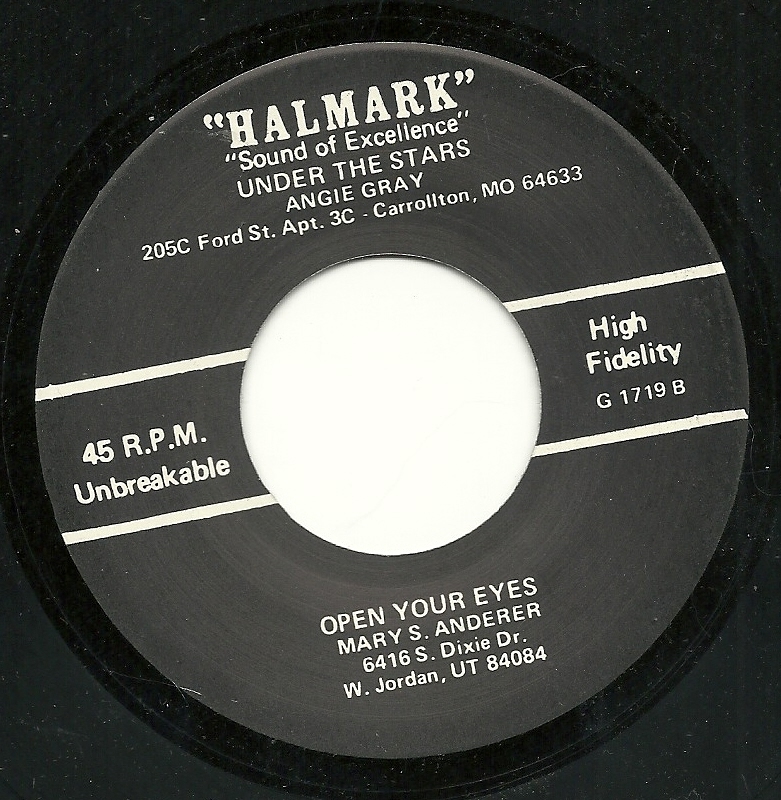 Click on the Halmark link (or just listen to the other three tracks here) if you want to hear what they usually produced. 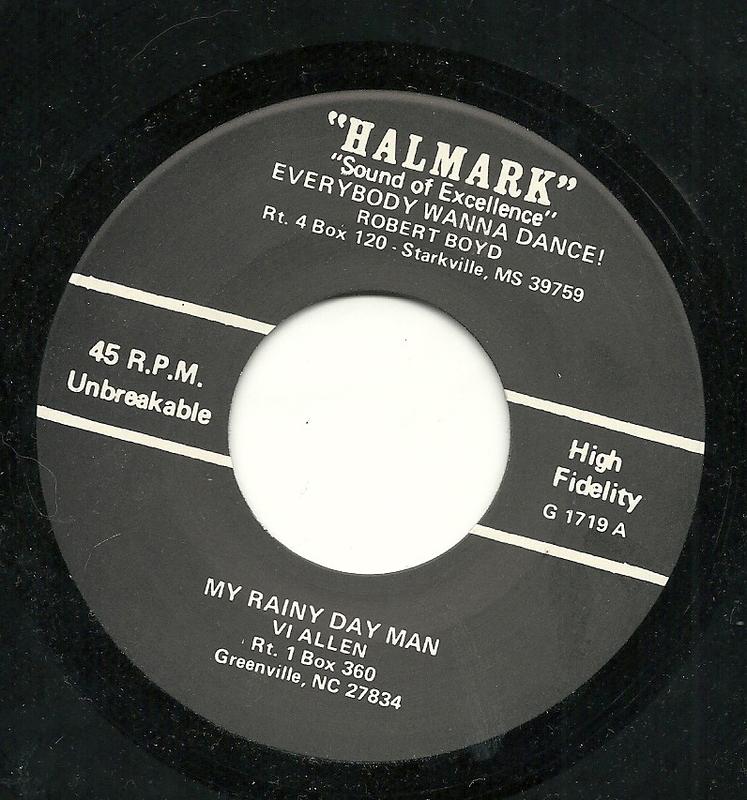 Download: Halmark Productions: Everybody Wanna Dance! First, courtesy of the prolific song-poem-ad-searcher Pete, here are two more fascinating ads related to the song-poem game. 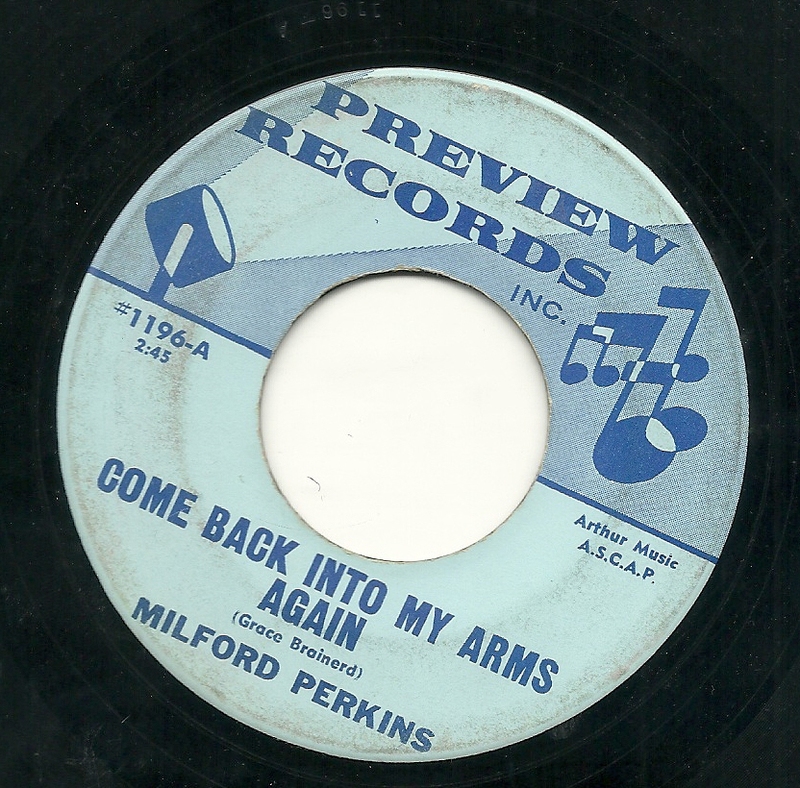 Today, we're going to hear from the great Milford Perkins. I'm not sure I've ever featured a record released under the name of Milford Perkins before, but if I did, I didn't put his name in the labels for the post. And I'm not doing so here, either, because Milford Perkins was one of the more common pseudonyms for Rodd Keith. In my experience, many of the records released under this name have a country tinge, which probably explains the country-singer-style name he chose for those releases, but that's not what this record is. 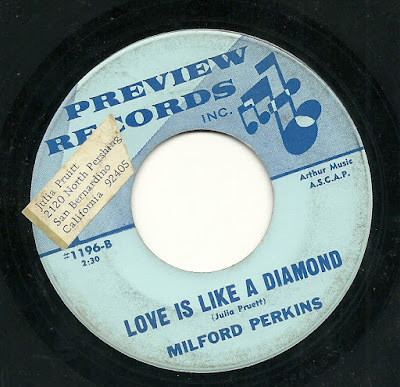 Instead, what we have here is a top-notch pop-rock side, titled "Love Is Like a Diamond", which features an indelible melody, a warm, inviting vocal from Rodd, and, best of all to my ears, some fantastic drumming - seriously, the fills on this record are otherworldly, as they are on many Preview records - I'd love to know who this drummer was. All around, an excellent record. I have far less to say about the flip side, "Come Back Into My Arms Again". Everyone's doing their job, but nothing about this side is particularly inspired, or even interesting. I do like the fact that the good folks at Preview claimed the song was a full minute longer than it actually is, on the label. First, I want to make sure I mention that I've updated last week's post. I had inadvertently linked to versions of the tracks which were running fast (maybe at 50 RPM instead of 45). Two days ago, I replaced those with corrected tracks, so if you have the old versions, you can go back and download/hear the corrected versions. Second, here are still more ads from 1922, via the magazine "Film Fun", and courtesy of Pete. There's a "wonderful proposition" in these ads - I wonder how many people took him up on it. "Reaper Block" was an office building on Washington Street, in the heart of downtown Chicago. Pete notes that Mr. Hibberler had multiple addresses, although I will add that the two addresses (on Keystone and on Dickens), would both be literally on the corner of Keystone and Dickens. Still, it's weird, especially since those addresses were, and are, for apartment buildings. Last week's post also featured multiple addresses for the same scammer. Some eight years or so before The Walt Disney Company released the giant hit film "The Love Bug", someone named Timberman submitted a lyric with the same title to the Tin Pan Alley song-poem factory, where label honcho Jack Covais took a co-writing credit and gave it to singer Jack Verdi, who seems to have been with the company only briefly (perhaps around a year), and who is listed as having appeared on four documented TPA singles. It certainly can't be for lack of talent. 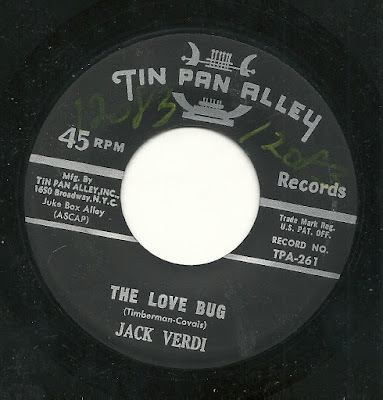 Verdi sells this song quite nicely, and the TPA team give it a nice music bed, and the whole thing lands somewhere between hipster jazz and rat pack cool, albeit with a budget of perhaps 1/100th of what either of those genres would have had to work with, on a legitimate label. Despite that drawback, the team involved here makes this work from start to finish. 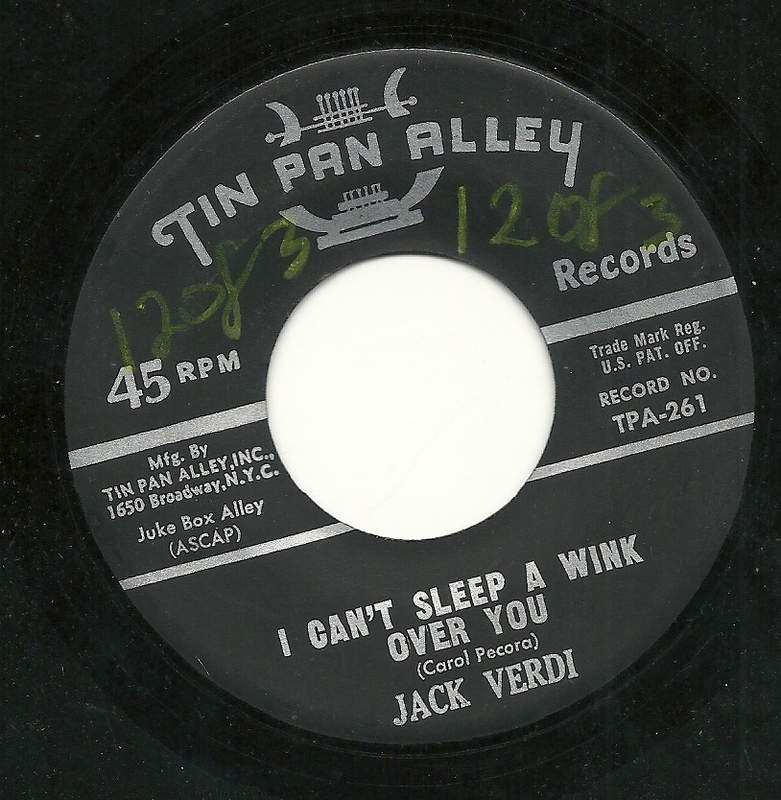 The flip side, "I Can't Sleep a Wink Over You", does not work from start to finish, at least not to my ears. It's overwrought, musically unimaginative and lyrically obvious. 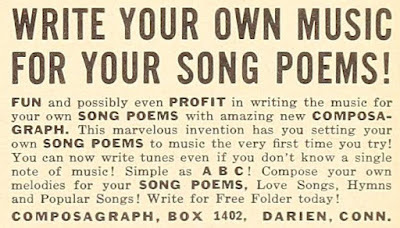 Before getting to todays record, here are two more very early Song-Poem ads, from "Film Fun" magazine, courtesy of reader and correspondent Pete! Note that these two ads seem very much to come from the same company, but that each is listed as being at a slightly different suite in the same building from the other. I've never before featured anything from the Command Performance label, first because I don't have very many records on this label, and second because they tend to be, to my ears, very bland, along the same lines as those recorded on the latter day (post 1974) Cinema and MSR releases. Not a surprise there - all three labels seem to have been using virtually the same core bands and singers. I just don't hear the magic in the music that seems to be guaranteed by the name of the house band at Command Performance. Based on what's been released on song-poem comps and other information I have, I suspect I'm in the minority in this opinion of this troupe and their various labels, and by all means, if you want to hear more from the MSR/Cinema/Command/Etc. gang, let me know - I certainly have piles of it. But this one stood out mostly because of the text of one of the songs, which we'll get to in a minute. 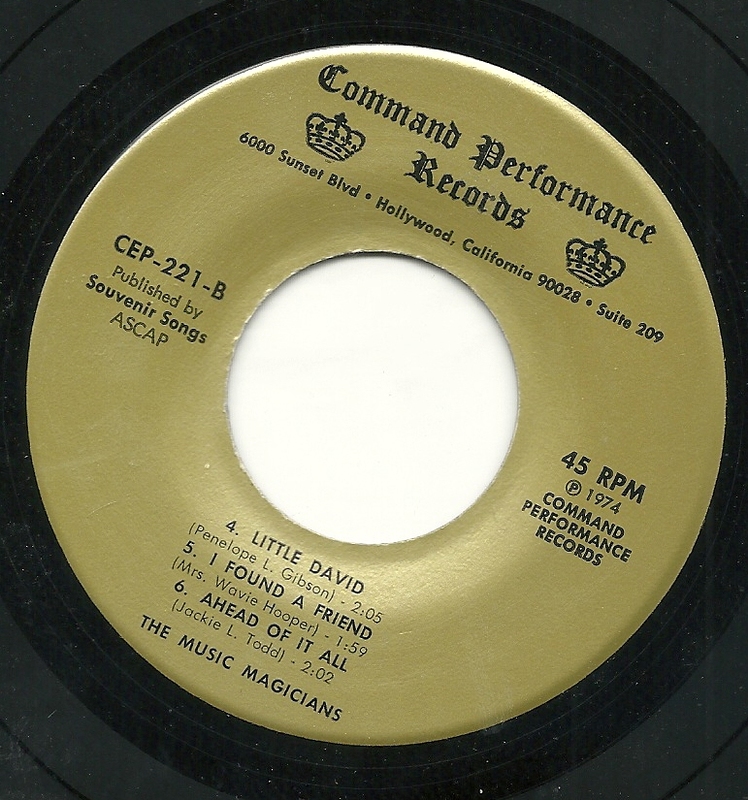 Like similar EP's on Cinema (and others on Command Performance), the folks at the label managed to squeeze six very short songs on the two sides of the 45, then suggested in the timings that the songs were mostly right around two minutes. One is, the rest aren't - and nearly every song is 12-15 seconds shorter than indicated on the label. I'm pretty sure the singer here is Bobbi Blake, and suspect that I know I'll hear from at least one or two people either confirming this or contradicting me. Oh, I will add that I was hoping that "Little David" was about the behind-the-scenes machinations at George Carlin's record label (which was called Little David), but sadly, that does not appear to be the case. 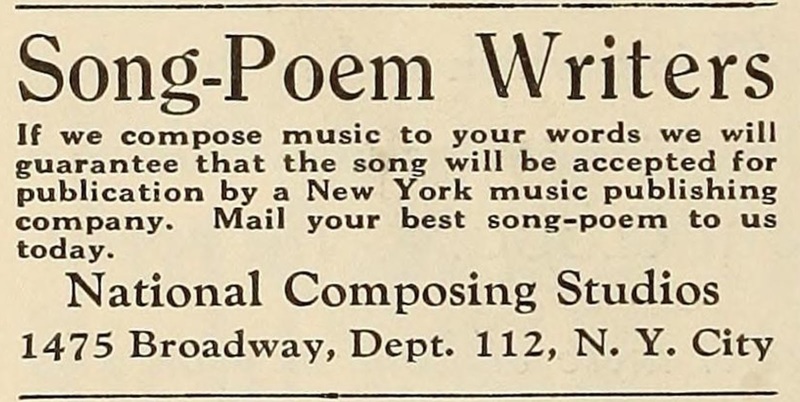 Well, before I get to this week's feature, I wanted to offer up two more song-poem ads that my correspondent Pete was nice enough to send along. These are truly ancient ads, coming from "Film Fun Magazine. The first one is from 1922, the second is from 1926. The latter makes note of a couple of gigantic then-recent hits allegedly written by amateurs - in neither case does this appear to be provably true, and, in the case of "Dardanella", is demonstrably false. Second, I want to link you to a new project that Sammy Reed has started. For a long time, I've had a link up to his strange music site, but that has now been shuttered. In its place (and in its place within my links) is a new project, featuring some wonderful oddities, including plenty of song-poems, called Music from the World of the Strange the Bizarre. That can be found in my links, to the right, and also with this link right here. 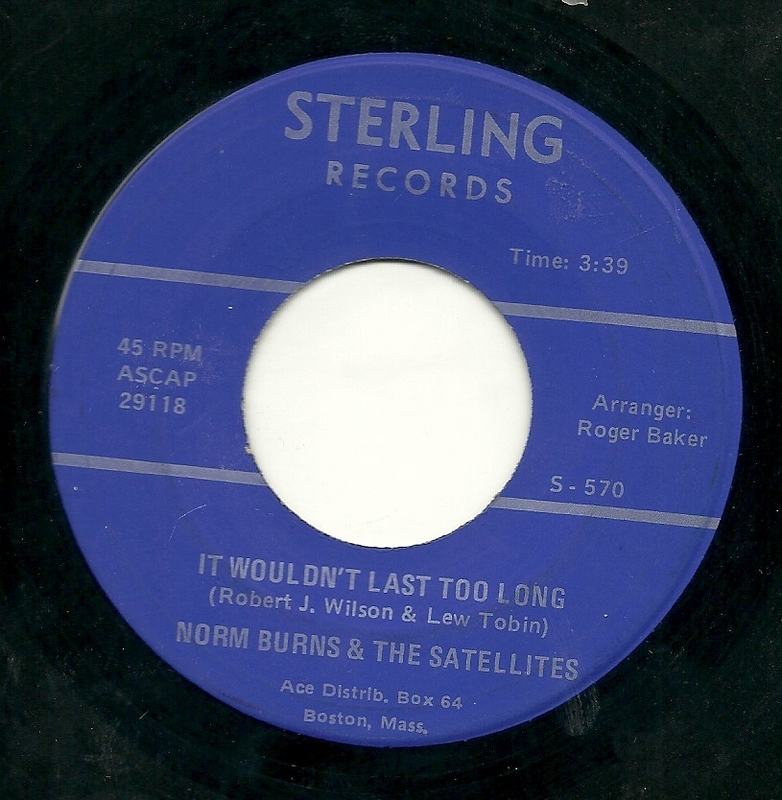 I wish I had more Norm Burns 45's. I wish there WERE more Norm Burns 45's, actually. But more often than not, when I obtain another one, it's worth sharing here. In this case, the song is "They Call Me the Clown". And actually, for this one, as much as I enjoy Norm, my attention is drawn to the slight extra effort that the folks at Sterling put into this one. The song isn't much - draggy and drippy, to be blunt - but someone had the bright idea of adding a trebly organ to the arrangement, and to have it play that famous circus tune (the name of which I don't know), although would it have been that hard to play the lick from that tune all the way through, rather than screw it up? And then, they actually dropped in some sound effects of people giggling and laughing. That's a nice touch! 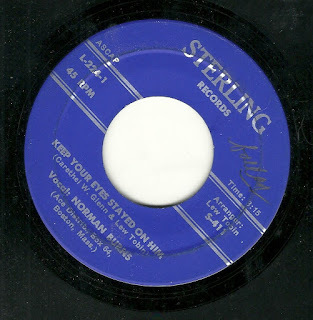 For the b-side, we're in for some real drama, and Norm and the band do a decent impression of a supper club group, and whoever set the words to music and arrangement certainly seem to have had Bacharach and David in mind. The words tell a sad, sad story, and there are some nice turns of phrase, which may get lost when the record goes on and on and on for almost four minutes. But this is an attempt at something stately, and to my ears, it doesn't fail entirely, which, within the song-poem universe, has to be considered a sort of victory. The "Air-Loom" label appears to fit the concept of a "tiny, regional" label to a T. Except that it probably didn't exist to promote actual attempts at hits, in the way that normal labels did. This was most likely the project of a few people, perhaps even just the one - Gail Hines - who wrote both sides of today's record. 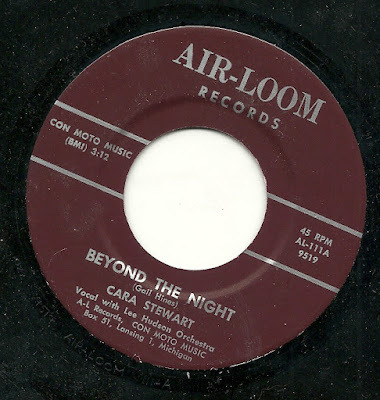 Pretty standard stuff for a Cara/Lee record, but I just eat that stuff up. 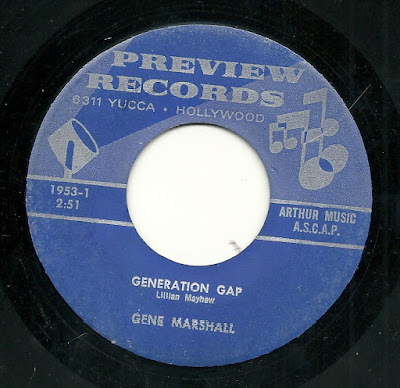 I'm featuring the Preview label for the second week in a row, which is unusual for this site, but I realized that it had been far too long since I featured the great Gene Marshall. 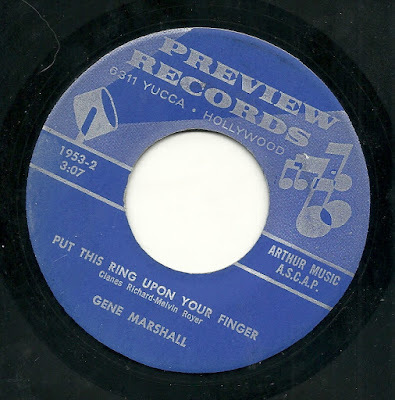 So here is Gene with a record that, based on its label number, was released in the early '70's, probably 1971, and based on its lyrics, could hardly have been written and recorded at any other time than within a window of three years or so on either side of '71. On the first side, the writer of "Generation Gap", decries the wide split between her (or, in Gene's rendition, his) children and their peers, and the not-so-old fogie singing the song. While the song starts out like so many complaints of the age did - bemoaning the gap between the generations, then laying on thick all the things that are wrong with the young folk, displaying quite clearly one of the reasons why there was a gap - in this case, the writer/singer turns it around in the end, into something more hopeful. 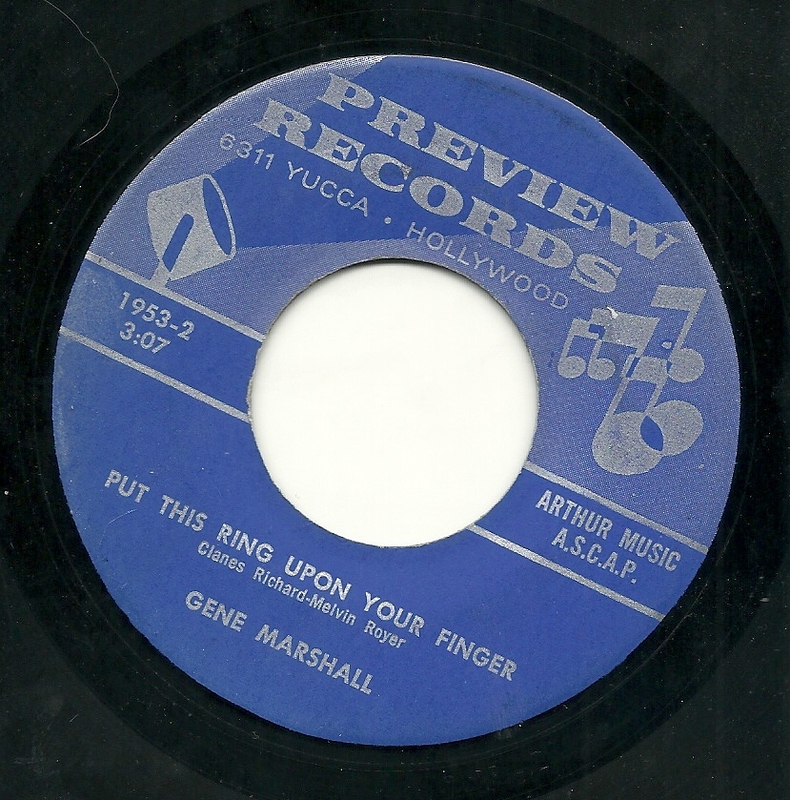 While all of this is, admittedly, treacle, I remain impressed at the level to which Gene Marshall sings it, with the cry in his voice while expressing the writers frustration, and the catch that sounds like he's about to start crying at a couple of key moments. Masterful. On the flip side, we have the deceptively musically upbeat tale of a Vietnam veteran returning home to his fiance, "Put This Ring Upon Your Finger". Everything is bouncing along quite happily, and continues to do so, even after the lyrics tell a different story. Not a lot of blathering or other great (or lesser thoughts) today. 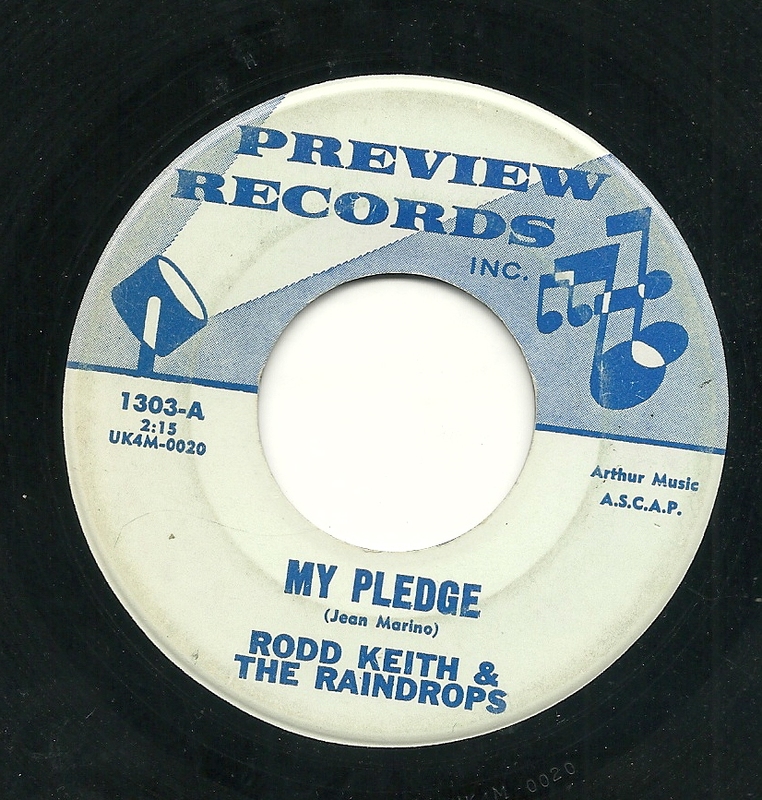 I just wanted to share a nice, solid 45 from Rodd Keith and the Raindrops. First up is "My Pledge", which has a bouncy, driving beat - the drumming here is great - and some keen flute playing, both leading off the track and being heard on a lengthy solo. All that in addition to a typically fine lead vocal from Rodd. 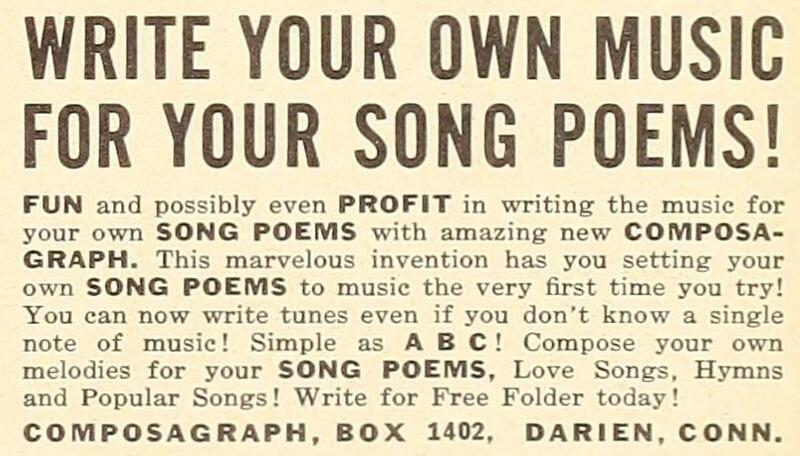 Well, first, I have the final vintage song-poem ad from correspondent Pete. This one is from 1958 and says everything it needs to with very few words. Three Cheers for Pete!!! THANK YOU!!! Today, I'm going to indulge my love for the early years of Tin Pan Alley, a period in which they were, to my ears, several steps above what many of the later labels would be doing, in that they were turning out records which actually sound like they might have been intended as attempts at earning actual radio airplay, and, not coincidentally, often were constructed with knowledge and insight into the various forms of music which were popular with the kids of the day. I have two records to share today, one of which is clearly a song-poem, and the other seems more likely to have been a vanity release - more on that later. First up is, by far, my favorite of the four songs involved. 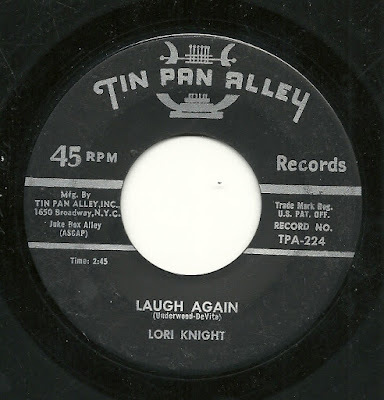 This one is sung by the previously unknown (to me, and to the song-poem database) Lori Knight. "I Love My Honey ('Cause He's Sweet)" is something of a relative to the honest-to-goodness hit record (and one of my favorite records ever) "I Love My Baby", by Jill Corey, which you can hear here. Obviously, the production and overall talent involved are considerably lower, but this is still what I'm reminded of. I truly wonder if this was deliberate, as Jill Corey's record came out in 1957 (that year being a high point, in my opinion, for pop music), and this record likely was made in 1958. I'm particularly taken (in case the title of this entry didn't give it away) by the song-poet's use of the phrase "Hooper Dooper", in place of "Super Duper", but the whole thing just makes me smile from start to finish. This one has risen to the top of my playlist faster than anything else in recent months. 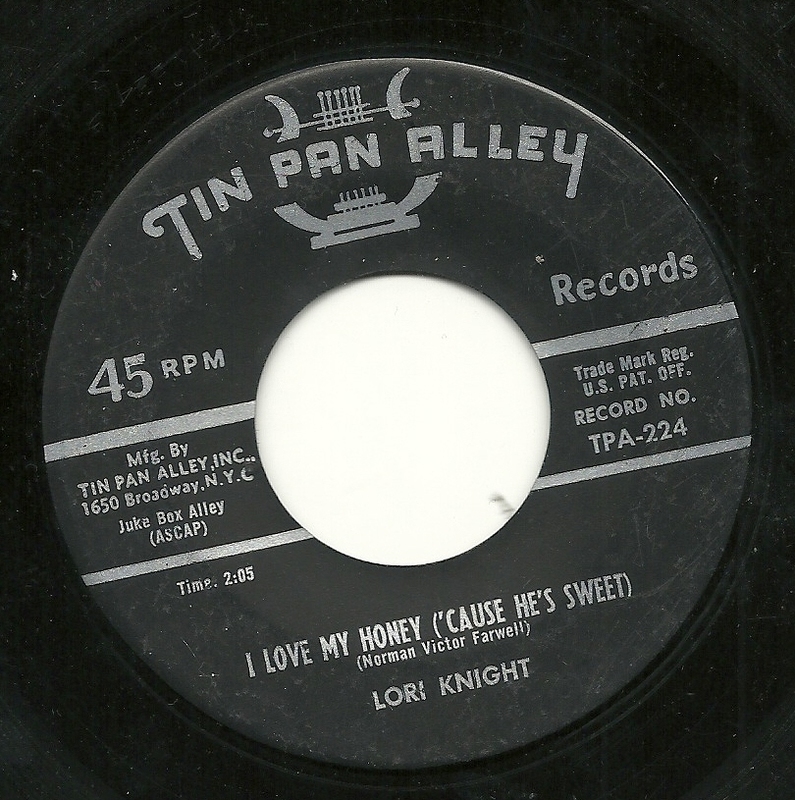 Please note that the song-poem was male, meaning that very likely that either he wrote it for a woman to sing about a boyfriend, or that the good folks at Tin Pan Alley turned the gender around to fit the available singer and the style of the music they'd put to his lyric. The flip side, "Laugh Again" is a pretty standard 6/8 ballad - what Billboard would have called a "rock-a-ballad" at the time. For those who like such things, it's listenable, without being terribly good or interesting. It does play up some of the weaknesses of the singer and band, which were masked by the enthusiasm and energy of the flip side. As mentioned above, I believe this to be a vanity record. It comes from TPA's earliest days, which you can read about here. 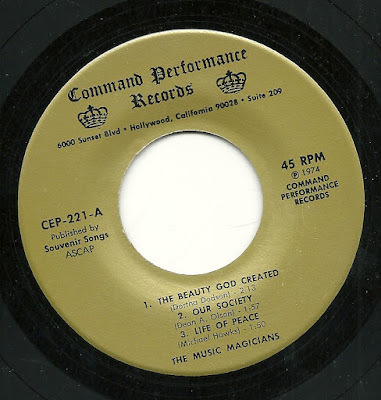 The number on this record comes just before the first documented appearance of Phil Celia, who was the first clear "song-poem singer" on the label - prior to this, there were bands and/or featured group-leaders, including some who were, or became, well known. 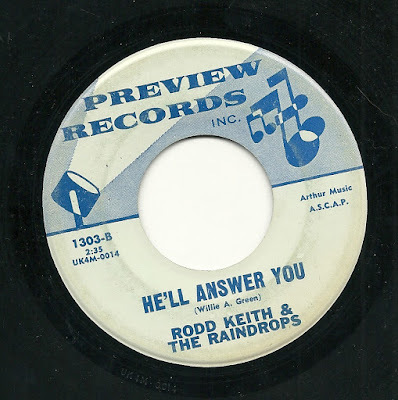 The biggest clue here, though, is that both songs on the record were written by a team of three people, the same three people on both sides, and that one of those writers had the same last name as the performers. Download: Larry and Nora Lee - Those Cheating Eyes! 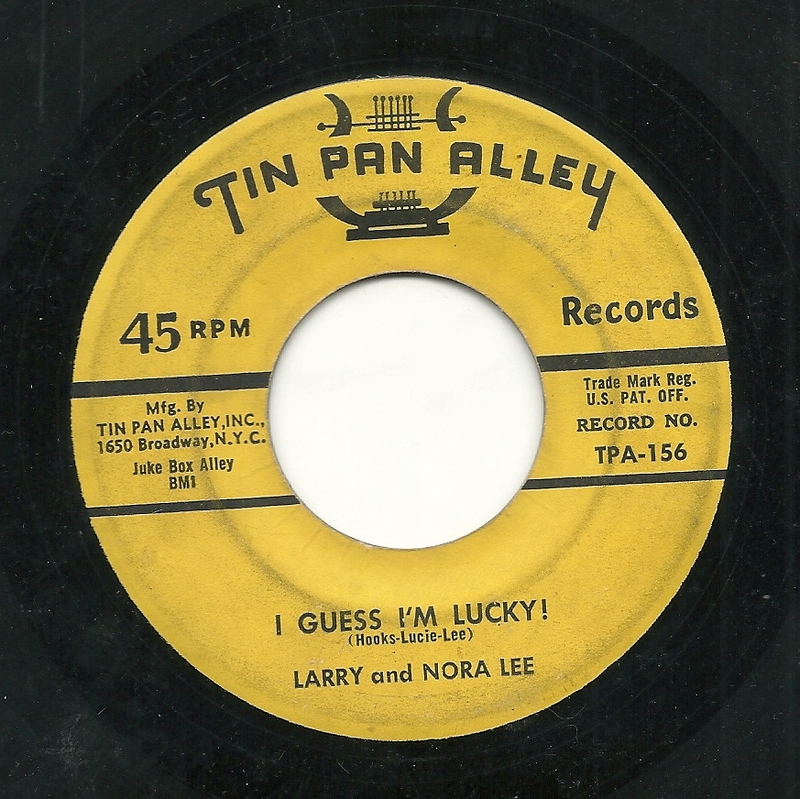 That's not to say that the flip-side, "I Guess I'm Lucky!" doesn't have its charms. It swings along happily, with sweet, glad-to-be-in-love lyrics, and sounds (as does the flip side) more than a bit like something that might have come out on my beloved Fable label. Download: Larry and Nora Lee - I Guess I'm Lucky! 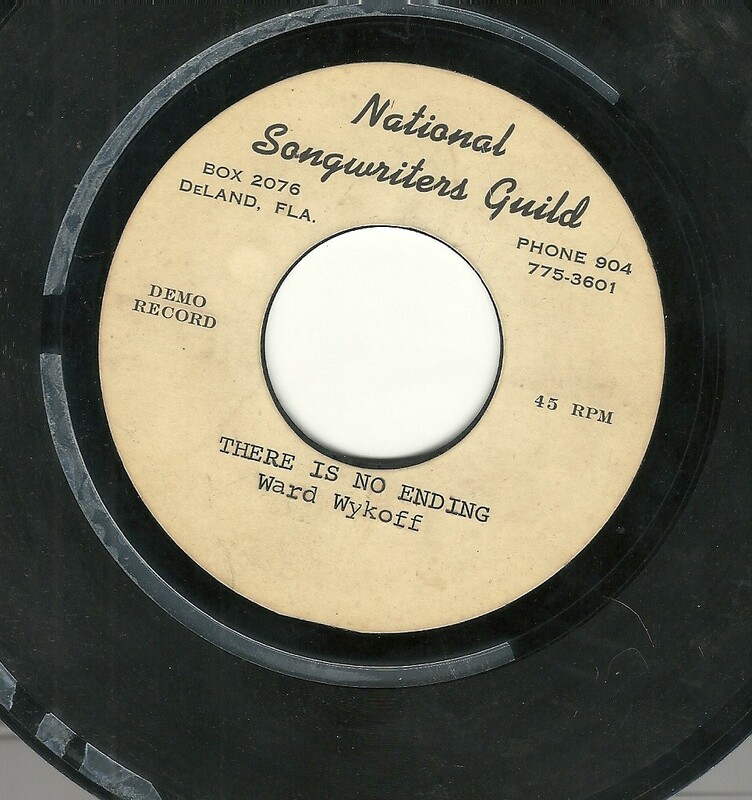 Here we have an acetate from the National Songwriters Guild organization. This label was associated with the much larger Tropical label, and the more often fairly interesting Carellen label. Read all about it here (with more information on the Tropical page, to which that page links). 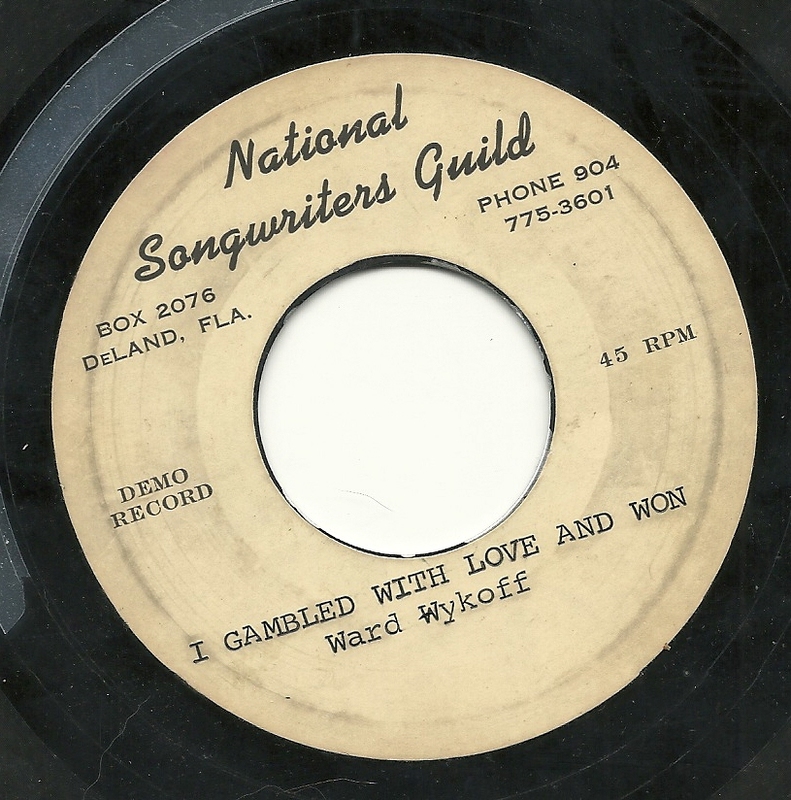 many of the known National Songwriters Guild records are unnumbered acetates. And I zoomed out a bit on the label scan of this one so that you can see the decrepit condition of this record, which will be confirmed when you hear it, particularly the other side of the record. There are no artists listed here, just the lyricist (same person on both sides), and I'm particularly amused by the incompetence displayed on "There is No Ending". There is a sing-songy nature to the rhyme scheme, where the easiest and most obvious rhyme is grabbed 90% of the time - you can guess what word is coming next. The exception is my favorite word use, in which that lyricist, having discovered that "ending" rhymes with "pending", uses that word, one that does not occur often in song lyrics, and which (to my ears) keeps on drawing attention to its use, and the lazy quality of the lyric writing that causes it to be there. That's how I reacted, anyway. On the flip side is the upbeat "I Gambled with Love and Won", sung by a different singer than "Ending". This one, as mentioned, is beat to hell, but the fun, bouncy organ playing drives the song for all of its 100 or so seconds, and the jolly singer (and surface noise) keeps me from focusing quite as much on the equally obvious lyric work.